The Samsung Galaxy Grand Neo comes in as the second entry in both the new Neo lineup from Samsung, and the Grand family. 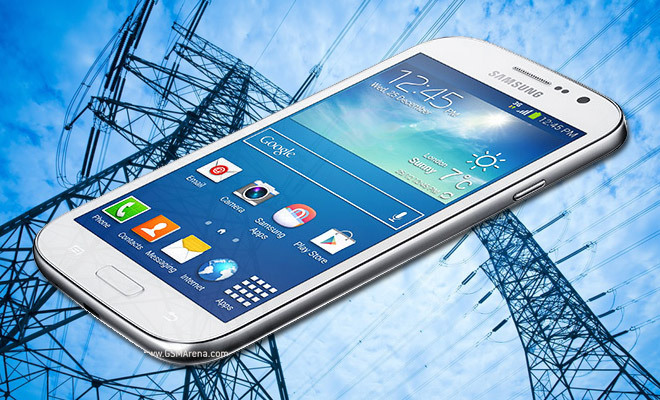 With a quad-core processor, it hopes to provide more capable performance compared to its predecessor, the Galaxy Grand. The battery size and overall specs remain the same, so we’ll have to see how much the bump in processing power impact battery life. Let’s dive right in! The Galaxy Grand Neo and Galaxy Grand are by and large identical devices, both sporting 5-inch WVGA screens and 8GB of internal memory, 1GB of RAM, and 2,100 mAh batteries. Both also come in dual-SIM variant, although our particular model is of the single-SIM variety. Our first test revolves around 3G talk time, where we hooked our Neo to and HSPA-enabled phone to see how long it would last before the battery gave out. 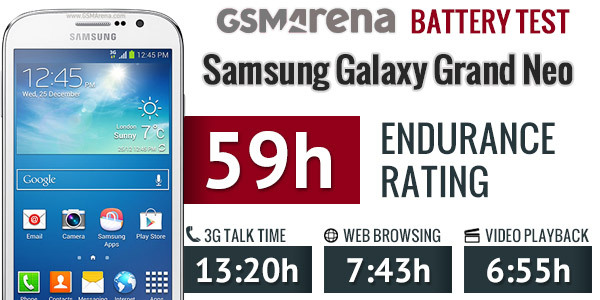 At over 13 hours it was able to outperform the original Galaxy Grand by 45 minutes, although that device was powering two SIM cards simultaneously. The our browser stress test tells a similar tale, with the Grand Neo scoring near 8 hours of surf time and the Grand trailing it by 3/4 of an hour. The slightly higher Jelly Bean build on the Neo (4.2 vs. 4.1.2 on the Grand) likely explains some of the variance. Finally, we tested the a looped video playback endurance on the Samsung Galaxy Grand Neo. With a score of just under 7 hours it leaves something to be desired, especially considering the Galaxy Grand managed over 8 hours. It’s likely that the quad-core Broadcom chip is not as optimized towards video as its dual-core counterpart, which would explain the discrepancy compared to the first two tests. Ever since the release of TouchWiz on Jelly Bean, Samsung has been better than most manufacturers at optimizing battery performance during standby. Its standby numbers really helped when it came to our overall endurance rating, where the Neo was able to score a very respectable 59 hours. This means that the Galaxy Grand Neo can last almost two and a half days if you do an hour of calling, an hour of web browsing and an hour of video watching each day. Be sure to check out our detailed review for more on the Samsung Galaxy Grand Neo.